A few months ago, because of your support, this young homeless mother and her two daughters moved into their own apartment. The route that KyShanaeh Johnson, 23, followed into homelessness is fairly typical. She had lost her steady job as a front-desk clerk at a hotel but unemployment benefits weren’t enough to pay her apartment’s rent. 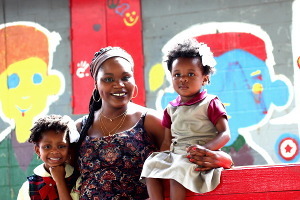 She and her daughters slept on couches and floors before ending up in shelters. But what isn’t typical is that KyShanaeh has been homeless or right on the edge of homelessness for her entire life. We know that New Orleans can only be as strong as its most unstable family. But because of the city’s high poverty rate, family homelessness is far too common. Nationwide, 1 in 10 households living in poverty experience homelessness at some point each year. But the rate is even higher here: 1 in 12 families living below the poverty line in New Orleans experience homelessness each year. KyShanaeh’s mom was homeless, so as a young child, KyShanaeh had been shuttled between an aunt and a grandmother. Both women had moved often, with KyShanaeh changing from one school to another. She lived briefly in dozens of different apartments. Then, after Hurricane Katrina, she and her brother and sister had moved in with another relative. That relative owned a house, which allowed KyShanaeh to make some consistent friends while she attended middle school and then high school in the same area. But she found it hard to trust people, even her own family. In her relative’s house, when money got tight, the relative’s children might get fed but she and her siblings wouldn’t. Or their shoes might get too tight and there was no money to buy new ones. “It was dysfunctional,” KyShanaeh said. KyShanaeh tried to make her own way. While living in emergency shelters and struggling with childcare, she graduated from a medical assistant’s program, earning a 3.6 GPA. With the help of rental assistance and case managers from UNITY and our partners, she now hopes to find a job in her field and make a life for herself and her kids. “I want my girls to be part of a stable family. I don’t want us moving back and forth like I did,” she said, noting that she’s currently looking for ways to expand their horizons, through an innovative summer camp or maybe even a neighborhood piano teacher. With your help, UNITY can continue its work rescuing homeless families, helping our neighbors become stronger and stable, so that New Orleans can become stronger and more stable.